Learn more about the food you are eating. Did you know that 90% of all GMOs (genetically modified organisms) come from Monsanto? DId you also know that Monsanto brought us: Agent Orange, PCB’s and rBGH. Is this the company we want to have controlling much of our food supply? 70% of all food in US commercial markets have bio-engineered ingredients. 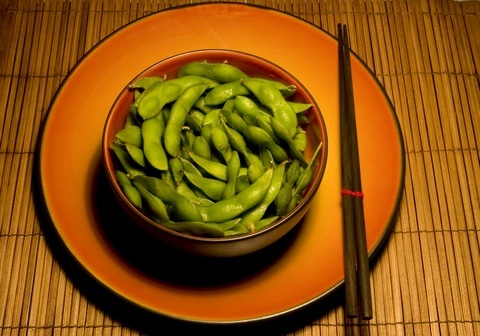 Soybeans are one of the most common GM (genetically modified) foods, so if you are not eating organic soy products, including edamame, you very likely are eating GM soybeans. One of the genetic modifications of these plants is to withstand heavy doses of Monsanto’s herbicide Round Up, and other seed companies have their own herbicides that they make their seeds resistant to. This means that the herbicide can be sprayed as heavily as needed to kill the weeds, but the GM crop does not die….but it has the residue of the herbicide. The same is true for GM corn. The World According to Monsanto is an important film to learn more about what is happening to our food supply. You can watch the complete film on this web site or buy it here on SmartLifeways from Amazon.